Do you want to study in Japan? If yes, this is an opportunity you been waiting for. 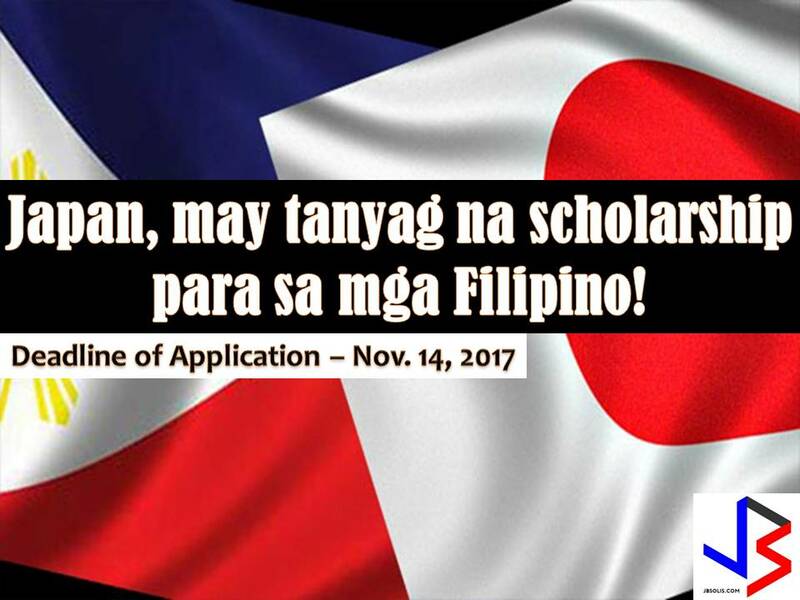 The Japan International Cooperation Agency (JICA) is now accepting applicants for one of the longest-running international scholarship programs offered by the Japanese government to Filipino professionals who want to study in Japan. This is the Project for Human Resource Development Scholarship by Japanese Grant Aid (JDS) is open for Filipinos engaged in formulating and implementing socio-economic development plans and become future leaders in their respective fields. The JDS is open to Filipinos, between 22 and 39 years old as of April 1, 2018, and is interested to pursue master’s degree in Japan to support Philippine development. To date, 319 Filipinos have received JDS scholarships. For those who are interested, please visit their website or contact JICE JDS Project Office in the Philippines, Unit 2-F1, Island Plaza Salcedo, 105 L.P. Leviste Street, Salcedo Village, Makati City at telephone number: 02-753-3261 or email jds.philippines@jice.org. Application deadline is November 14, 2017.